Email marketing is a critical part of an eCommerce marketing strategy, but it’s all for nothing if the emails never reach your recipients’ inbox. Unfortunately, that’s a reality for many businesses. Nearly 21 percent of commercial emails fail to reach their intended inboxes. Email deliverability measures the amount of emails that actually reach your recipient’s inbox without bouncing (blocked by the ISP) or getting marked as spam. If you have an unusual number of emails that don’t go through to your subscribers, you have a deliverability problem. The first way to improve your email deliverability is the most important. If you have a deliverability problem, this method will point you in the right direction. ISPs evaluate your trustworthiness as a sender using a score called the Sender Score. Sender Score assigns a number to every outgoing mail server from one to 100. ISPs want to see a high score. They’ll automatically reject your emails if they fall below a certain value. Do you have lots of inactive subscribers? Wake them up with these re-engagement techniques. Sender Score uses basic email marketing metrics like unsubscribes, bounces, and spam reports to determine the score. “The number one thing ISPs love to see is high levels of engagement, which means lots of recipients opening, clicking, reading, scrolling, and engaging with your emails on a regular basis,” says Mike Madden, marketing manager at Marketo. Check your Sender Score report regularly. Take the appropriate action based on the report if your score starts to slip. If you feel your engagement is low, reawaken your subscribers with a re-engagement campaign. Using a specially-built email service (like Jilt!) will also help here (see #8). Double opt-in is when subscribers receive a confirmation email after initially subscribing to your email list. They opt-in once when they complete the form on your site and again when they click the confirmation link in the double opt-in email. They aren’t subscribed until they finish the process. Deliverability rates are higher for email lists that use double opt-in because the confirmation weeds out people who never intended to engage with your email list. Therefore, double opt-ins also reduce unsubscribes and improve open and click-through rates. There is a drawback, however. Your email lists will grow slightly slower. According to Campaign Monitor, 20 percent of initial subscribers won’t click the confirmation link. There are two types of bounces: Hard bounces and soft bounces. A hard bounce is when you send an email to an account that’s closed or otherwise doesn’t exist. ISPs track hard bounces and will reduce the deliverability of your future emails if you continually trigger hard bounces. Remove any email addresses that hard bounce immediately. A soft bounce is when you send an email to an account that’s full or unavailable. ISPs don’t punish your deliverability as much as hard bounces, but it’s still best to purge any email addresses that soft bounce repeatedly. Jilt automatically retries emails for soft bounces, and cleans hard bounces from campaigns (and we won’t charge you for emails that never reach your customer because of a bounce). We’re also working on ways to pre-validate emails to avoid hard bounces completely. The “From” name is the first piece of information the recipient sees before they open an email. If they don’t recognize the name, they could send it right to spam. Whether you use your company name or your personal name, use the same name consistently. If you need to change your “From” name, use both names (separated by a slash or some other character) for several emails to help your readers adjust to the new name. Subscribers are often suspicious of attachments because the file could contain a virus or some type of malware. This is especially true if the email is the first they’ve received from you. ISPs feel the same way. Attachments are a popular method for spammers to avoid putting content in the body of an email that would get flagged as spam by text-based filters. Plus, attachments disrupt the user experience. In some cases, they’re cumbersome, impossible to download due to firewalls, and hard to read on mobile devices. Just don’t use them. If you want your readers to download a file, store it on your website and link to it in the body of your email. When people add email addresses to their contacts list, their email client then accepts that all messages from those addresses are safe and wanted. Messages from trusted addresses won’t be blocked even if they look like spam. You can improve deliverability by encouraging your recipients to add your address to their contacts list. Make your request plainly in the first email they receive and add a little note in the header or footer of all your other emails. You can find more comprehensive lists here, here, and here. 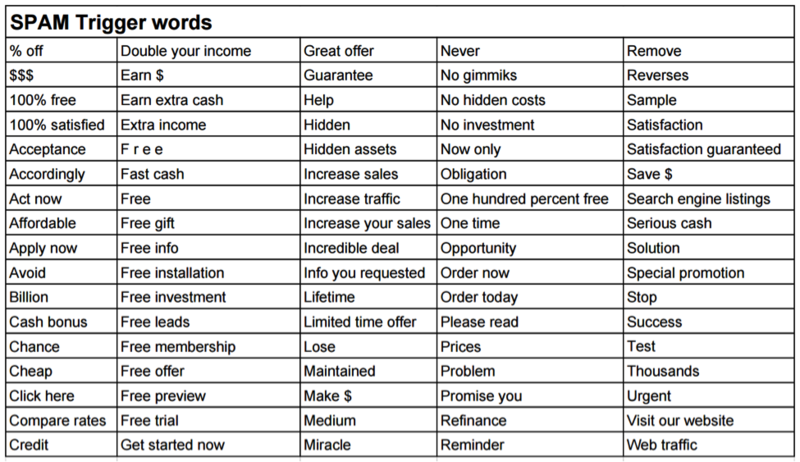 Some spam trigger words are pretty innocent, so it can be tough to avoid them all. Your deliverability won’t suffer if you use a few, but using many in the same email could flag your message. Yes, email marketing tools come with a cost, but they’re trusted by ISPs, so using them can improve your deliverability. Don’t send thousands of emails from your personal account or via a WordPress plugin that uses your web server to send mail (obviously many email marketing tools offer WordPress plugins, such as Jilt’s WooCommerce or Easy Digital Downloads plugins, and those are okay). Some email marketing tools come with a built-in feature that measures the likelihood of your email ending up in the recipient’s spam folder. These features usually rely on SpamAssassin, an open source, third-party service that ISPs use to analyze messages. Emails are measured on a 0-10 scale. Keep your score below 5 for reliable deliverability. 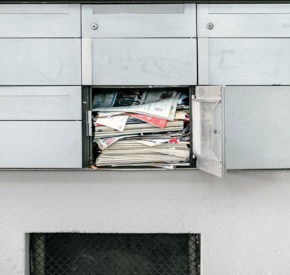 Naturally, ISPs want to reduce the load on their infrastructure as much as possible, so they show preference to senders who routinely send small emails. It’s fine if your message occasionally exceed 40KB, but try to keep most of them below that threshold. If your emails are too large, images and GIFs are the usual culprits. Optimize your image file size and reduce their dimensions to exactly what you need for the email (don’t rely on the HTML or CSS of your email template to resize large images). ISPs set up spam traps to identify spammers and block their emails. A spam trap is an email address that looks valid, but doesn’t belong to a real person. The spam trap email is placed on the web as bait where people or robots harvest them without permission and then spread them around to other spammers. In some cases, ISPs use invalid email addresses or very old email address that were abandoned years ago. Since spam trap email addresses can’t opt-in to your list naturally, the only way you could have them is if you obtained them without permission. How ISPs punish you for hitting a spam trap can vary depending on how often it occurs, the type of trap they set, and their policies. Hitting too many spam traps will damage you Sender Score or get you blacklisted. You can avoid spam traps by regularly purging your lists of inactive and invalid email addresses, and by only adding emails to your list through permission-based means. Consistency is one of the big factors that impacts your Sender Score. ISPs don’t like erratic and/or random behavior, so it’s best to stick to a consistent schedule. That doesn’t mean, however, that you can’t send a lot or often. You can send thousands of emails every day, just take steps to avoid sudden spikes unless those spikes are consistent. For example, let’s say you send 300 emails every day for a variety of reasons – cart abandonment, account registration, order confirmation, etc. Then you send 10,000 emails every Tuesday for your weekly newsletter. That’s consistent. But if you sent 10,000 on a Tuesday, then 4,000 on Thursday, then nothing for three weeks, then another 25,000 on a Friday, your Sender Score might suffer. How much is the right amount to send? That depends on your business and your customer. Don’t send so few that your recipients forget who you are between campaigns, but don’t send so many they feel overwhelmed and mark you as spam. The best way to discover the right balance is through testing. Email lists built through contests and giveaways are notoriously poor. People enter multiple times with spare email addresses. Sometimes they use nonexistent or invalid addresses. They don’t care about your list — they just want the freebie. If you collect emails through a giveaway, scrutinize them carefully before sending. Delete any that look obviously suspicious or fake. Under the CAN-SPAM Act (in the U.S.), your emails must come with a link to unsubscribe from your list. 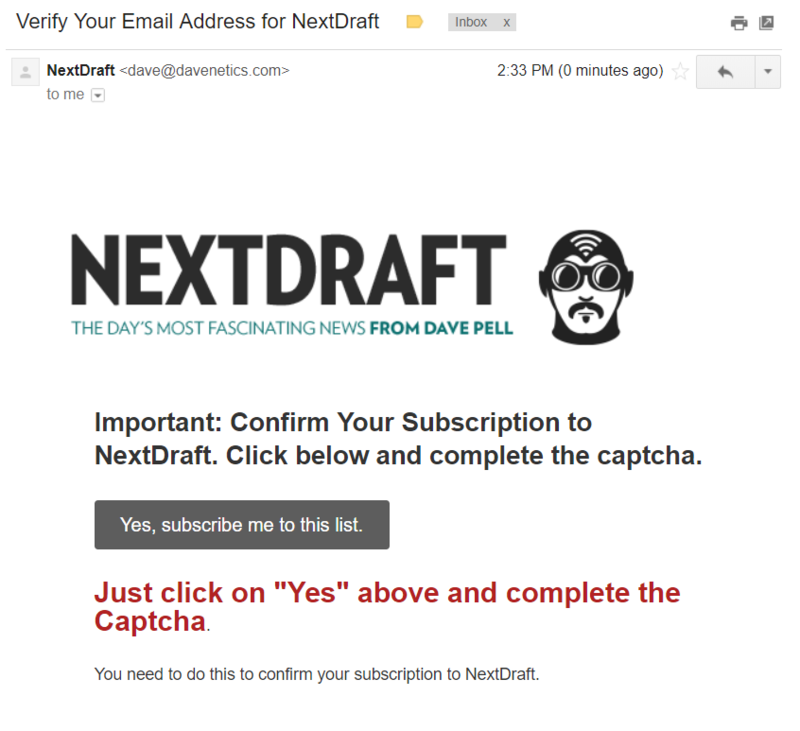 Some less-than-honest marketers make this link hard to find in the email so subscribers can’t opt out. This worked in the past, but now most email clients come with a one-click “report spam” button. If your subscribers can’t find the unsubscribe link, they’ll just send your address to their spam folder. Unsubscribe those who request it quickly, too. Some email lists take days or weeks to actually remove someone after they’ve clicked “unsubscribe.” If you send an email after the recipient unsubscribed but before your system actually removed them, there’s a strong chance the receiver will mark your message as spam. Have a lot of unengaged email subscribers? Wake them up with one of these re-engagement strategies. It’s important to keep in mind that ISPs protect their customers. If your recipients get a lot of value from your emails, they’ll open them, read them, and click your links. These engagement actions tell ISPs and email clients that the user enjoys the emails, making it more likely those emails will get through. So above all, please the end user. Create emails they want to read and you’ll enjoy strong deliverability. This site has helped me personally and helped me help others to get the actual knowledge of email marketing. I am so glad you decided that you need to pass it on because we all need it passed on. Very interesting. Do you have lots of inactive subscribers? Wake them up with these re-engagement techniques. Subscribe to receive this extra resource and our newsletter.